ENGLEWOOD, CO., December 31, 2018 (Newswire) ​MADSKY MRP is proud to announce a new name, brand identity, and tag line. Many of our customers, contractors and homeowners know us as MADSKY Managed Repair Program or MADSKY MRP. Moving forward, we will be known as MADSKY. The book of services provided by MADSKY is much broader than a managed repair program leveraged by insurance carriers for repairing a policyholder's roof. MADSKY has updated its brand identity; the logo has been modified to be in alignment with its business strategy and direction. 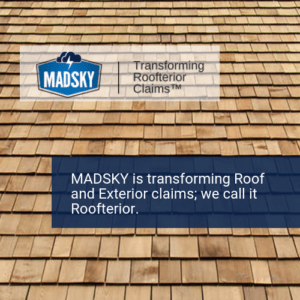 Through the re-branding process, an official company tag line has been created – Transforming Roofterior Claims™. When a storm damages a roof of a home, more than 90% of the time the storm will damage the property and surrounding exterior and interior of the home. For any claim managed by MADSKY, the roof, property, and the exterior and interior of home will be assessed and restored. As part of this process, MADSKY launched a new company website and updated the homeowner & contractor experience journeys within MADSKY's proprietary claim management system.